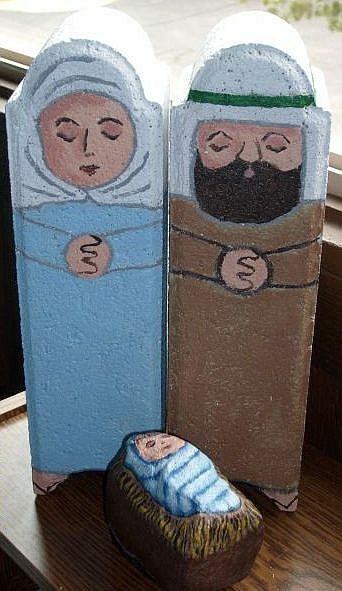 This simple outdoor nativity set painted on garden pavestones is sure to catch visitor's eyes as they approach your home for a holiday gathering. Mary's robe is painted using light blue outdoor acrylic paint; Joseph's robes are painted with a light brown outdoor acrylic paint. Both headdresses are painted white; Joseph's headband is green. Baby Jesus is painted on a large rock; His swaddling clothes are blue and white. This item is available for pick up only in Pueblo, CO.